I wanted to show you what my final Valentine gift to my husband looks like. After I uploaded this same little box with store-bought chocolates in it, I took your advice and made some Chocolate Cream Cheese Oreo Truffles! Could you answer just one question for me? 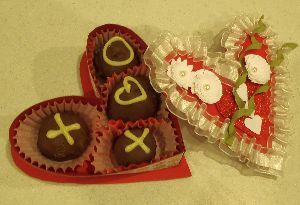 How do you keep from eating the truffles yourself before you give them to the person you made them for? It's a real temptation to me! Lol! After banishing my hubby from the kitchen I took this photo tonight. The true life colour is much brighter and the drizzles are white, as I made them with white chocolate. OK I just thought of a plan. I am going to try to keep some of the other truffles for our church meeting tomorrow night. Maybe the thought of giving my church friends a special treat will keep me out of the refrigerator. I'll let you know (smile). Susan, this looks great and oh so much better than the "store bought" candy (although I do love those too). I'm sure your husband is going to be thrilled with your Valentine gift. I know how tempting it is to eat all the Oreo truffles yourself, believe me! They are so more-ish, aren't they? One good thing is that those truffles are so easy to make that you can always whip up another batch when these run out. Grin!